While designed as a tool to study nuclear architecture, Tools for Analysis of Nuclear Genome Organization (TANGO) is an open-source software package that can be broadly used to process and analyze three-dimensional fluorescent images. The software package consists of a Fiji (or ImageJ) plugin for image analysis and an R package for statistical analysis. (Note that the software stores information using MongoDB, a free program that must be separately installed on the computer.) The TANGO website provides a link to download Fiji and TANGO together, as well as instructions for how to download the TANGO plugin from within already installed versions of Fiji. 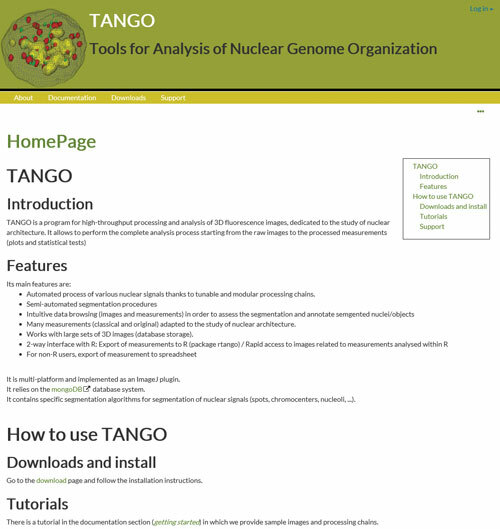 Additionally, the website includes a great deal of valuable information for new users of the software, including the PDF version of the original TANGO publication, various tutorials, and a FAQs page.